Compared to February 2017, applications increased by 23 percent relative to the previous month. “Mortgage applications for new homes accelerated in March, with the Builder Application Survey Index reaching its highest point since the series began in August 2012,” said Lynn Fisher, MBA’s Vice President of Research and Economics, in a statement. “The pick up from a fairly modest February showing suggests that developers are finding ways to bring new product on line to help supplement otherwise low inventories of existing homes for sale in the US. The Market Composite Index, a measure of mortgage loan application volume, increased 1.5 percent on a seasonally adjusted basis from one week earlier. The refinance share of mortgage activity decreased to 41.6 percent of total applications, the lowest level since September 2008, from 42.6 percent the previous week. The FHA share of total applications decreased to 10.7 percent from 11.1 percent the week prior. The VA share of total applications increased to 11.3 percent from 11.1 percent the week prior. The 30-year fixed mortgage rate on Zillow Mortgages is currently 3.84 percent, unchanged from this time last week. 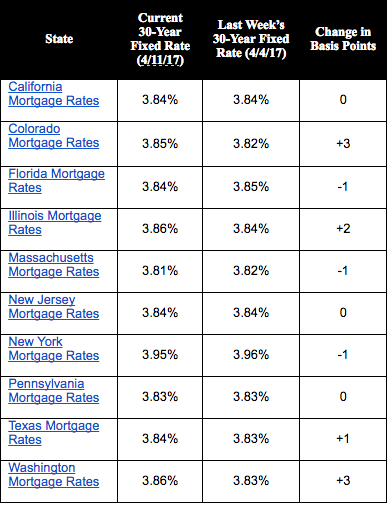 The 30-year fixed mortgage rate hovered around 3.86 percent for most of the week before falling to the current rate. The 30 days or more delinquency rate for January 2016 was 6.4 percent. In January 2017, 5.3 percent of mortgages were delinquent by at least 30 days or more including those in foreclosure. This represents a 1.1 percentage point decline in the overall delinquency rate compared with January 2016. March 2017’s median sales price of $420,00 was up 5.3 percent or $21,000 compared to last year. This is the highest March median sales price of the last decade, easily topping the prior high of $400,000 seen in 2015. Sales volume across the D.C. metro area was nearly $2.3 billion, up 26.7 percent from last March. The median days-on-market for March 2017 was 15 days, 12 days lower than last year. The Baltimore Metro area median sales price of $245,000 was up 3.2 percent from last year, up 6.5 percent compared to last month, and at the highest March level since 2008. Sales volume across the Baltimore Metro area was up 21.7 percent from last year to $923.8 million. The median days-on-market was 42 days, down from 63 days last year, and at the lowest level in a decade. Data provided by MarketStats by ShowingTime based on listing activity from MRIS, a Bright MLS.